Not all robots needs to be big and clever — those that are small and simple could prove just as useful. Like this little thing created by researchers at EPFL, which folds, flips, jumps and walks, while only weighing four grams. Created by the Reconfigurable Robotics Laboratory — which has strong robot form — it is in fact modelled on the inchworm, a caterpillar which has a walking pattern where it lies flat and then arches up. But the robot, known as Tribot and shown on either side of the above image, can also jump whilst it walks, launching itself into the air up to seven times its height and then carrying on moving as soon as it lands. It can do that because of the fact it weighs just four grams. Clearly a jumping robots needs to be light, and this one uses springs made from a shape memory alloy of Titanium and Nickel. Those springs remember their initial shape and snap back to it when warmed slightly — in this case, by a little electric current. Then — pop! — up it goes. 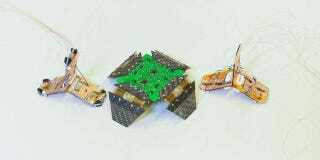 The researchers claims that the beauty of these little robots could be how easy they are to store and transport. “Just like Ikea furniture, these robots could be shipped in flat layers that could then be easily assembled,” explains Jamie Paik, who leads the research.